El Tajin is a pre-Columbian archaeological site, that was at its height between 800 and 1200. It is the best preserved and most thoroughly excavated pre-Hispanic town of its period (after Teotihuacan fell into decline). El Tajin was the capital of the Totonac state. The site's most famous building is the Pyramid of the Niches, which shows the astronomical and symbolic significance of its buildings. to Juan who complained that no climbing is allowed at El Tajin: you do realize that the pyramids are ANCIENT, WEAK and need to be PROTECTED!! Climbing is not allowed for very good reason. Heat is also to be expected, Veracruz has sup-tropical climate. You complain too much! 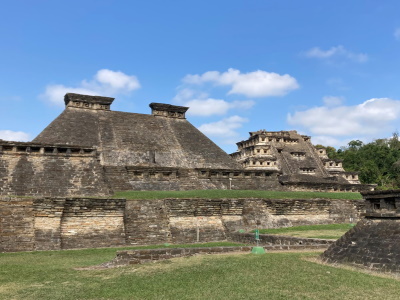 El Tajin is a magnificent site and I recommend taking a whole day to visit the pyramids. Bring an umbrella (if you want to shade yourself) and water with you, and be sure to wear tennis shoes. Arrived noon in a scorching summer day. Frankly, it was disappointing -- the hot weather and lack of shade may have something to do with that impression. In addition, you are not allowed to climb any structures. I have since visited Chichen Itza and Uxmal, and if they deserve to be on the WHS list (both do, the latter more deserving), Tajin does not. Kabah, a non-WHS site near Uxmal, is more worthy of a visit. El Tajin may not be amongst the most famous of Mexico’s pre-Hispanic WHS but is well worth a visit unless you have surfeited on the others! Its location near the Gulf coast means that the vistas behind the inevitable pyramids are of tree clad hills rather than semi desert and the atmosphere is likely to be hot and steamy! As you enter the site you will pass a high “Voladores Pole”. You have a chance here to see this spectacular ritual performed (photo 1) – you will be accosted and told when the next performance is (a “donation” is expected if you stay/return)! The pole here is metal and the event set up for tourists but it is better than nothing if you are not in a village where it is performed with a wooden pole as part of a local fiesta (We saw preparations such a performance over Semana Santa in the “Popocatapetl Missions” WHS of Tetela del Volcan). There are also performances across from the entrance to the National Anthropological Museum in Mexico DF. El Tajin was the only site in Mexico where I was able to get my “over 60’s free entry” –everywhere else it has been limited to Mexican citizens and registered overseas residents. Otherwise entrance is 48 pesos (c US$4.5 in Mar 2008). The site and museum take around 2-3hrs to visit at a fairly leisurely pace. The site’s “peak period” lasted between around 300-1100 AD and it was unused by the time Cortes landed some distance down the coast towards Vera Cruz. The usual ball courts and pyramids are well represented. The route for visiting, shown in our 1990 Michelin guide, was no longer open and, in common with all Mexican pre-Hispanic sites other than Teotihuacan, the climbing of pyramids has been forbidden. Similarly the “underground passage” in “Building D” was closed. The most famous sight is that of the “Pyramid of the Niches” (photo 2). It is one of the structures used by Mexico generally to advertise its pre-Hispanic past and has appeared on its (and Panama’s!) stamps – so you may “know” it! There are supposed to be 365 “niches” (we didn’t count them!) with of course an astronomical significance. There are also some interesting and historically quite important (for understanding the rituals of the game) carvings on the walls around the “South Ball Court”. Large parts of the site haven’t been excavated and it is worth going across to the “Gran Greca” area where the jungle is still partly in control! The peoples who built El Tajin were Totonacs and the notices around the site have explanations in the local language as well as Spanish and English (Monte Alban was the only other pre-Hispanic site we saw on this trip to do the same for its local language). We asked a nearby guardian and she said that she spoke very little Totonac but nearby Papantla is the tribe’s stronghold and the Voladores come from there. Arriving early on a Tuesday, I was nearly alone as the fog created an atmosphere of magic that increased as I moved through the site. The birds were still singing as I entered the ball court with base relief images. I continued to be astounded when I arrived at the pyramid of the niches. Walk up the hill and image a busy day centuries ago as you look down upon the religious site. Stay as long as possible before reentering the 21st century outside the gates. Visited by Alexander von Humboldt on his travels: From Humboldt's "New Spain" vol II "In the northern part of the intendancy of Vera Cruz, west from the mouth of the Rio Tecolutla, at two leagues distance from the great Indian village of Papantla, we met with a pyramidal edifice of great antiquity. 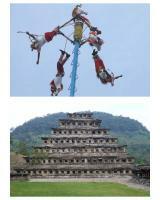 The pyramid of Papantla remained unknown to the first conquerors. It is situated in the midst of a thick forest, called Tajin in the Totonac language. ? The Indians concealed this monument, the object of an ancient veneration for centuries from the Spaniards; and it was only discovered accidentally by some hunters about thirty years ago." 51 Community Members have visited.